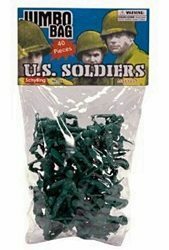 These ‘army men’ little green soldiers captured the imaginations of many a youngster in the 1950s. 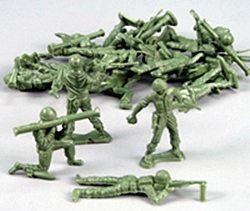 Plastic army men toys have been an American tradition for generations. At Louis Marx and Company we make vintage inspired toy army men that will spark the imaginations of young and old alike! There are endless possibilities with a collection of plastic army men, from simulating battles to intricate displays. There may be many options for toys these days, but nothing beats the green army men that allow kids to really expand their imagination and truly create a world of their own. There is a reason why they continue to be a staple in homes all across the United States. Army men were first manufactured in the late 1930s in metal. They didn’t gain widespread popularity until the 1950s. Switching from metal to plastic brought the costs down to mere pennies per figure. The post war baby boom meant that the majority of kids, Dad’s , were recently in a war so interest in the toys skyrocketed. The individual toy figures were retro-fitted to resemble WWII soldiers with the appropriate helmets and weapons. They were sold in bags of 20 to 100 pieces. The toy soldiers were positioned in 4-5 different poses to accommodate a variety of weapons. These included rifles, sniper rifles, machine guns, pistols, grenades and bazookas. Some sets even included jeeps, tanks and artillery pieces. There were also ‘enemy’ army men like the German soldiers who were made in gray plastic and Japanese soldiers molded in yellow. A visitor to this site wrote to me to let me know that he had written a nostalgic novel/memoir about being an 8 year old in the 1950s. He was very big on army men and other subjects as he recollects his childhood, a bit of arson and life as a child in the 1950s. 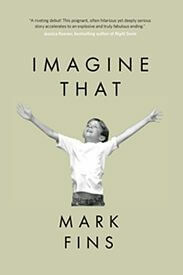 In the book, Mark Fins’s fascination with his army guys comes to fruition with the staging of an immense battle using living, breathing neighborhood kids. I think it’s a good read but here is a snip-it so you can see for yourself.